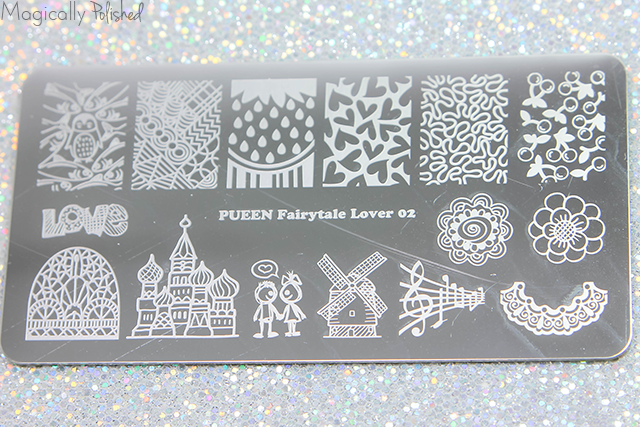 PUEEN Fairytale Lover 02 Is such a fun stamping with so many cute designs, especially for the upcoming season. For this look, I wanted to create something I would definitely wear on Valentines Day or use different shades of color for a fun "hearty" look. For the base I used LVX Mondarin. Once completely dried I then applied Pueen Super Intense: 806 Pure White over the heart design and sealed it with top coat. 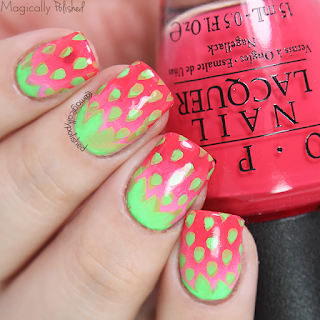 For this look, I wanted to try one of the designs off the package...strawberry nails. 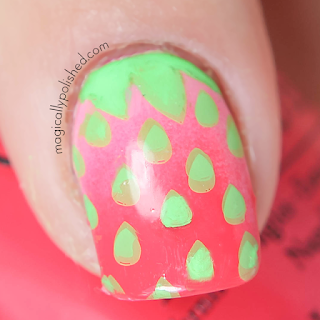 I've been meaning to create strawberry nails freehand, however, as busy I have been this was the easiest to do. 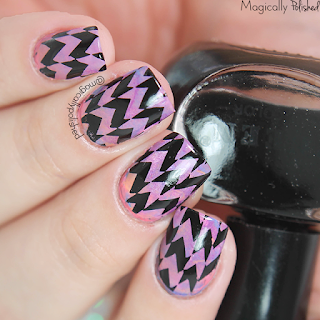 I create gradient with some of the shades from OPI New Orleans Collection. Once completely dried, I then stamped the design with two tones of green shades and sealed with top coat. For this look, I wanted to create something bright and fun to wear. I first applied two coats of Pueen Super Intense: 805 Black Jack for the base. 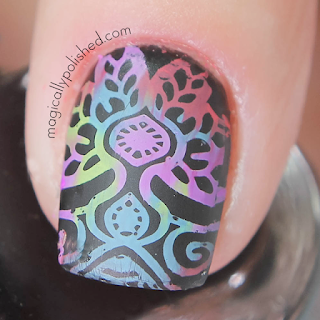 I then added some of the different colors of BMC Weekend Warrior Stamping Polish and sealed it with Essie Matte About You. 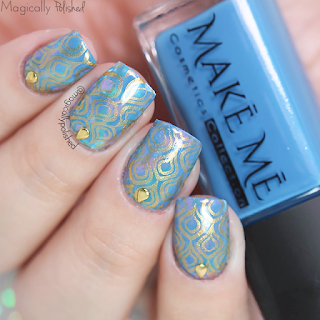 For this look, I wanted to create something that resembled peacock colors. 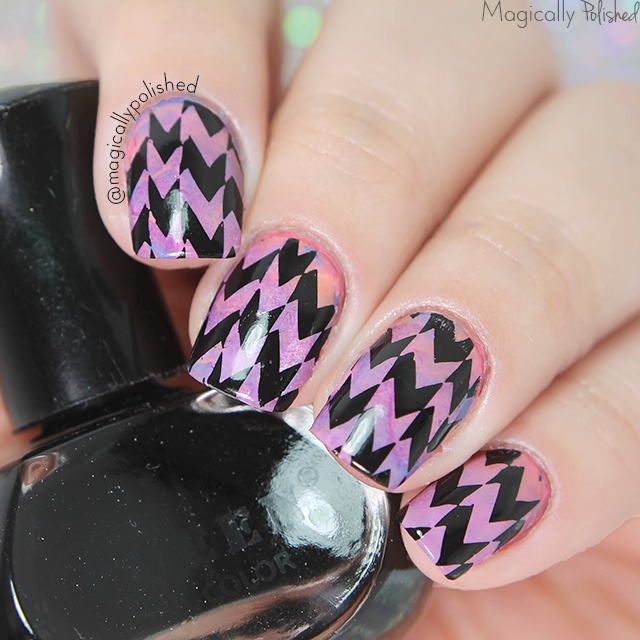 For the base I applied two coats of Make Me Cosmetics Surfboard!. 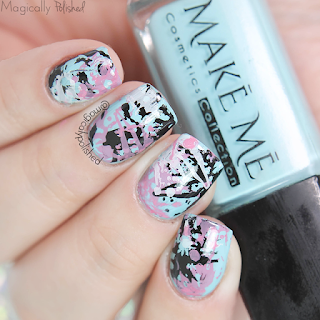 I added a few brush strokes using Make Me Cosmetics Make'em Wonder. 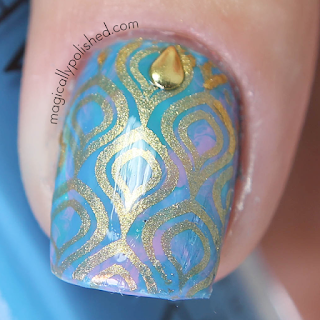 Once dried I stamped the pattern with a gold polish and added a few droplet studs, sealed with top coat. 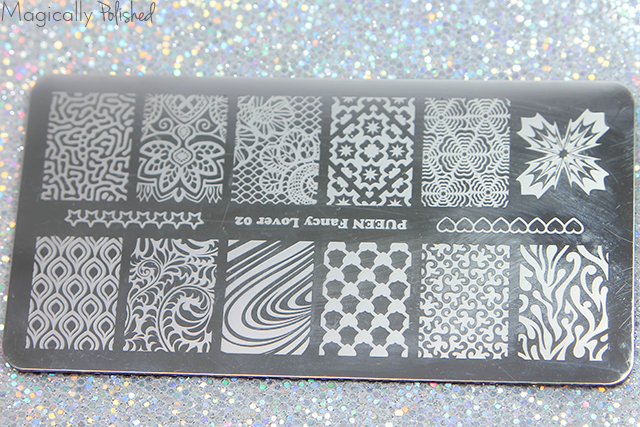 Is one of my favorites, since I love all geometric designs. For this look, I went for a black and gold design. First I applied two coats of Pueen Super Intense: 805 Black Jack. Once completely dried I then applied a coat of Zoya 18k Gold Flakes Top Coat and then stamped the pattern with a gold stamping polish. 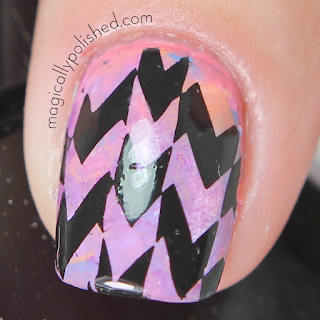 Sealing it with top coatI then added a little triangle stud on each nail. Pueen Super Intense: 805 Black Jack and sealed them with top coat. 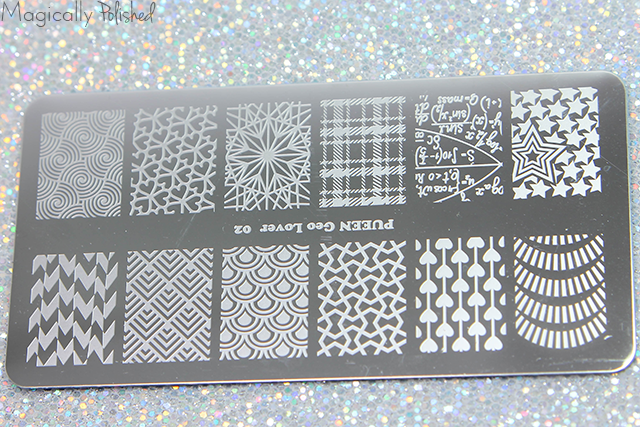 Is a lovely plate with all nature based and of-course a splatter design. 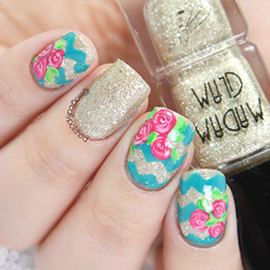 Perfect for the spring. 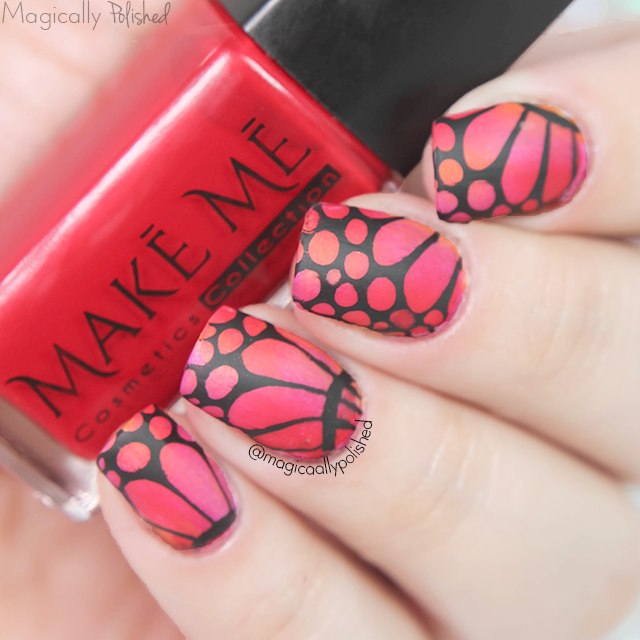 Butterfly nails is one of those designs I've never tried to do. 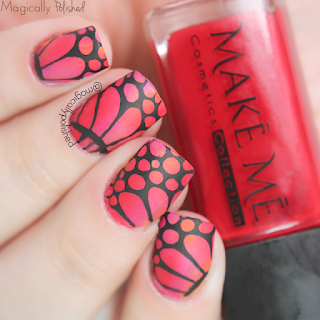 For the base I sponge s gradient using Make Me Cosmetics Coke Body and Sun Kisses. 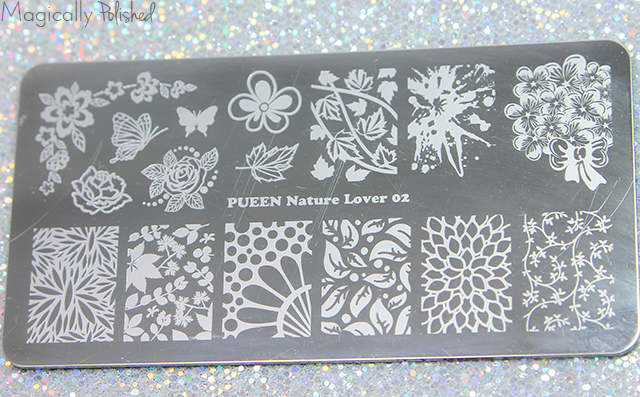 Once dried I then used Pueen Super Intense: 805 Black Jack to stamped the pattern and sealed it with Essie Matte About You. 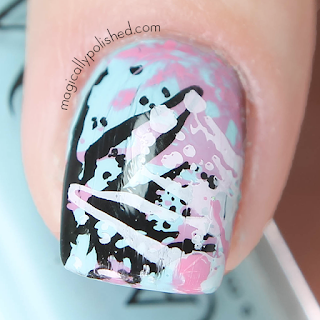 For this look, I wanted to use the splatter pattern. Honestly I don't understand what splatters has to do with "Nature", however, it was pretty fun to see what I can come up with. 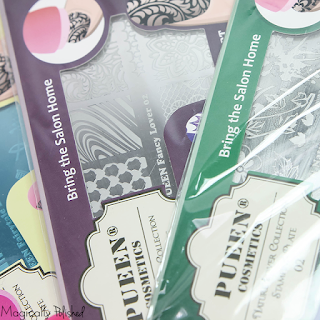 I began with a Make Me Cosmetics Heels on Wheels and used Promise Me Forever, Pueen Super Intense: 805 Black Jack and Super Intense: 806 Pure White and sealed with top coat.